I partnered with Stonyfield on this blog post – they sent us a gift card in the amount of $50 to spend as a part of their Pay It Forward campaign. One of our favorite things to do as a family is to eat. We love trying different foods and getting our daughter involved in trying out different recipes and doing taste tests. So when Stonyfield sent us $50 as a part of their Pay It Forward campaign, our family knew exactly where we wanted to donate. My daughter felt strongly about helping kids like her and those who lived where we live – in the United States. Of the many different ways kids in the United States are in need, she really wanted to meet the needs of those who were food insecure. We first discovered No Kid Hungry while watching our favorite kid cooking shows on The Food Network. When we went on the website to check them out, we were shocked at some of the statistics on childhood hunger. 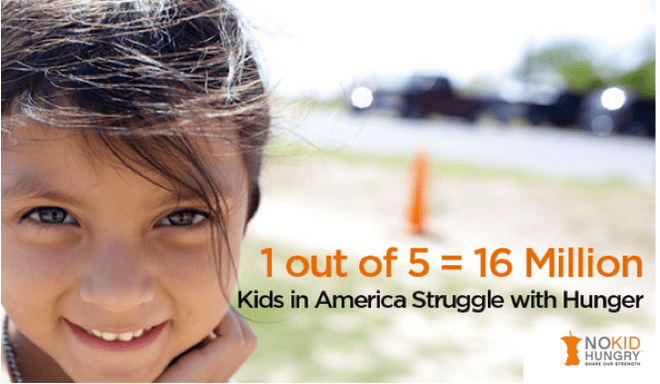 1 in 5 kids don’t get the food that they need. 3 out of 4 teachers say their students regularly come to school hungry. It was amazing that every $10 donated to No Kid Hungry feeds up to 100 meals for a child facing hunger. Ninjette was excited that our $50 ended up providing 500 meals! In addition to our Pay It Forward donation, we plan to collect items for our local food pantry in January. Many local area food pantries get low on food and supplies after the holidays. This opportunity gave us a chance to talk about children that are in need and the different ways that they could be in need. We were able to brainstorm and put together a list of things that we could do in the coming year to meet those needs. Paying it forward all year long is a habit we want to practice as a family to remind us that we are a part of a larger community and that one of our values is to help those in need. We are going to make paying it forward as one of our family’s new year resolutions. How will you pay it forward in the new year?